In my mind, this is so the colour of autumn. It racks up Christmas feelings as its the colour of mulled wine and of juicy cranberry sauce. 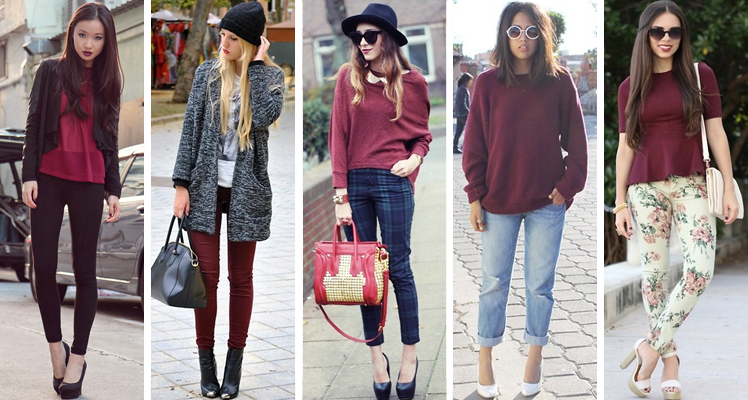 Oxblood is a rich yet soft colour and it suits all skin tones. I myself own a pair of trousers but I think this colour also works well with accessories too to brighten up an all black outfit. I particularly like this trend worn in block and paired with a dark, velvety, burgundy lip and relaxed, loose locks. 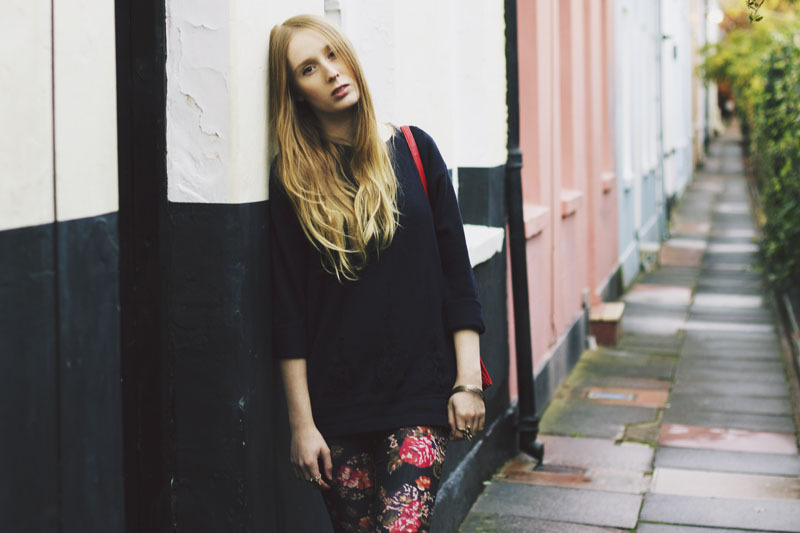 Below is a selection of fashion bloggers who know how to wear oxblood to its full potential. I received this beautiful blouse from Lovestruck recently and I've been waiting for an opportunity to wear it. It is such a lovely colour which goes so well with my winter warm black basics and I could easily wear it all year around. I'm looking forwards to wearing it with white shorts and sandals in the summer! 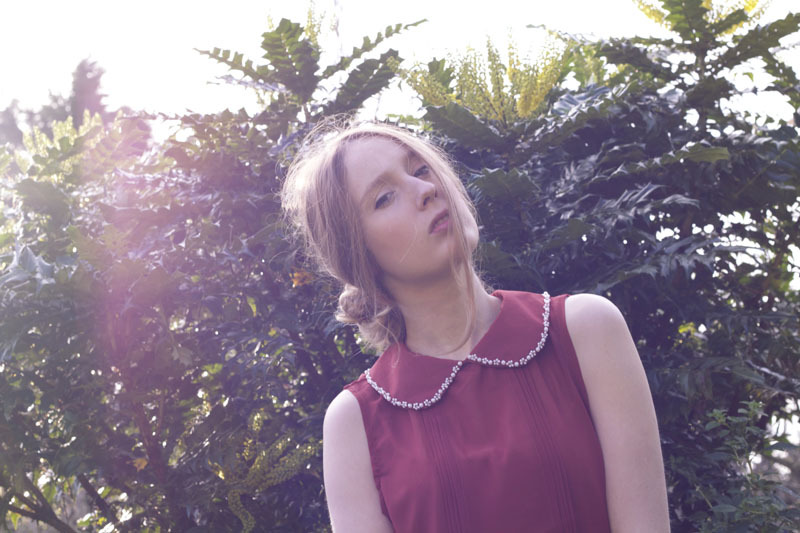 I wore it up in Bath at the weekend and its so pretty its the perfect blouse for a smart casual occasion. 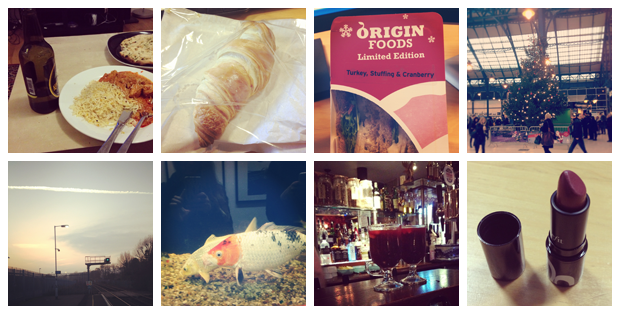 I was super busy working during the week but was luck enough to enjoy a lovely weekend away in Bath visiting my Nanna. We had a lovely time visiting the American Museum in Bath where my Nanna volunteers and going to the Christmas market in town. My Nanna just recently go a cat called Beau and he is the sweetest ginger thing I've seen all month. My Nanna has a massive tank full of tropical fish and Beau is constantly watching them and tabbing on the glass, he's very amusing but I am slightly concerned he may end up in it one day when the tank is being cleaned and no one is looking. 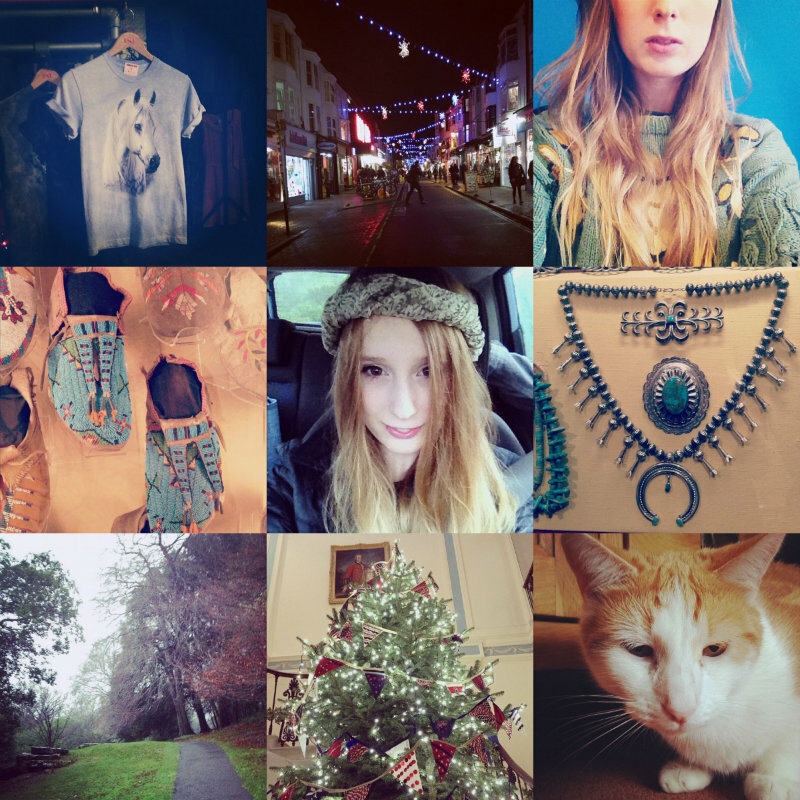 I decided to change to layout of my moments posts as I felt I could do with posting bigger images, what do you think? An improvement? 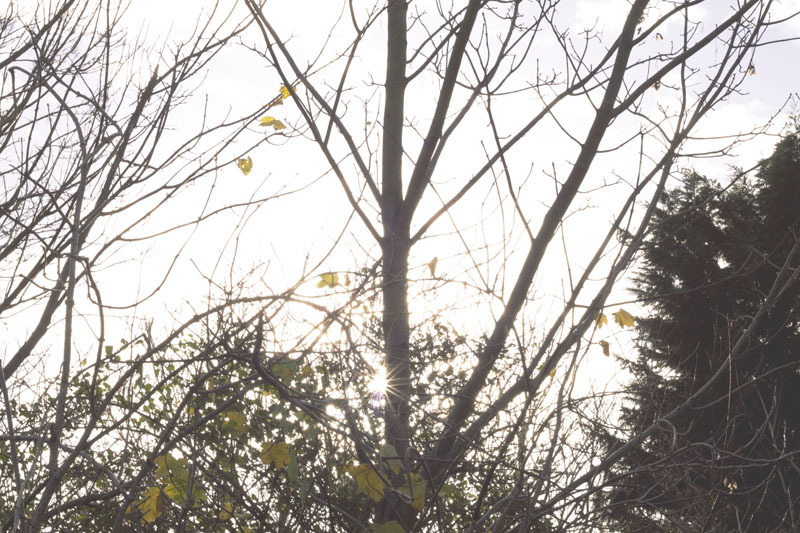 Hope you've all enjoyed a lovely week and are looking forwards to Christmas! 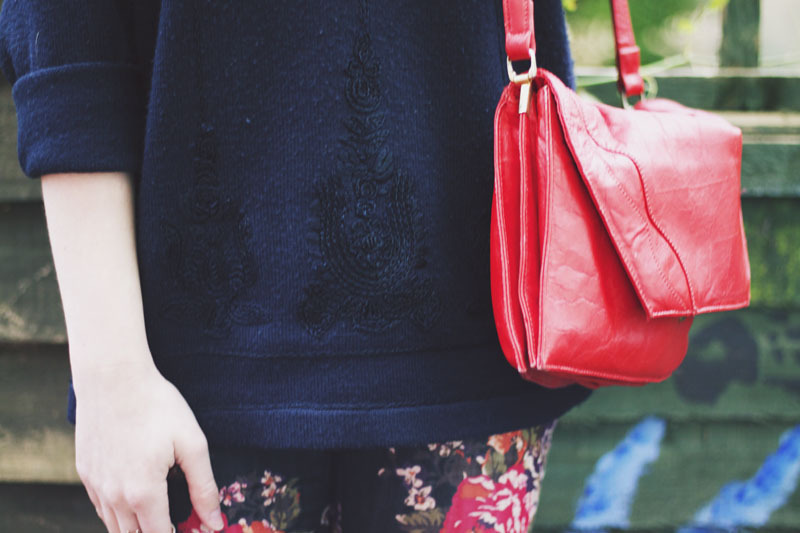 Velvet is such a great fabric to wear in winter. Its so warm and thick and unlike most other warm gear it is chic too! It can come in many variations too including crushed velvet and flocked velvet which looks great layered. 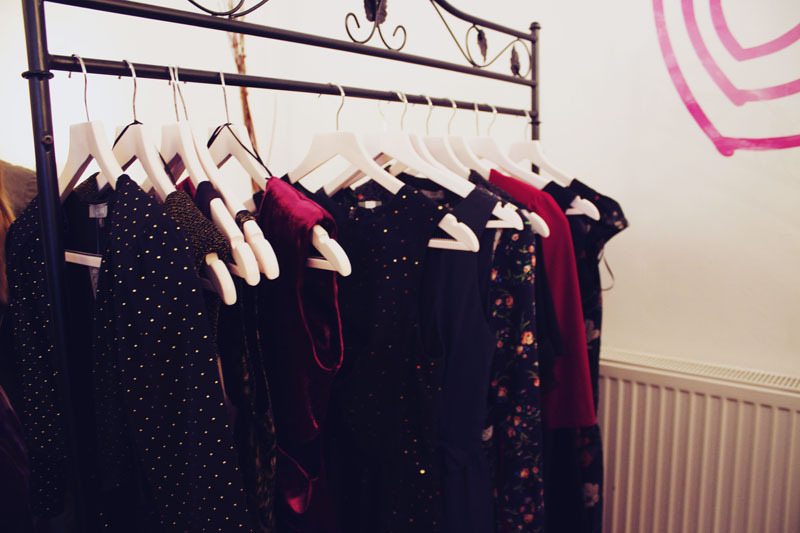 I particularly love this trend in jewel colours such as burgundy, evergreen, plum. It is a great 90s look especially teamed up with creeper heels and a dark divine lippy. 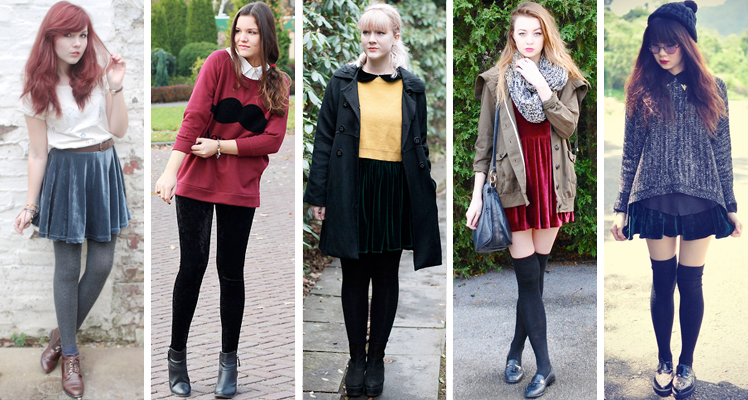 To inspire you how to style this trend I've featured some bloggers below rocking their velvet wardrobe. Click on the boot names to view the boots. 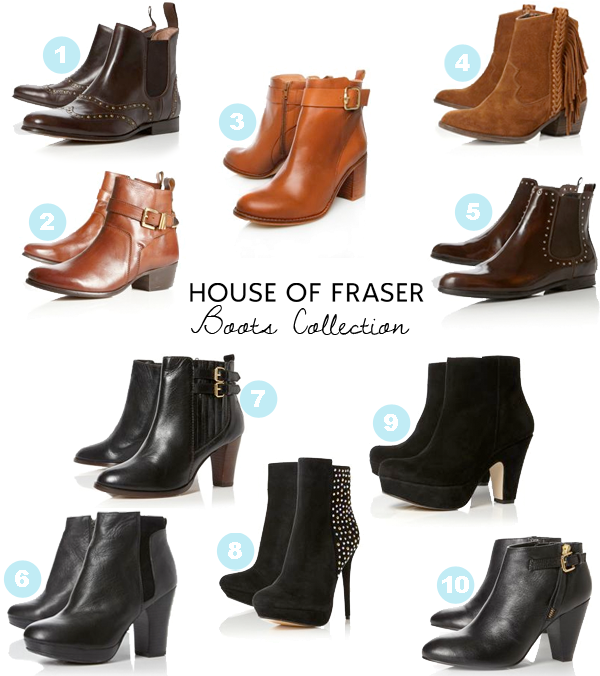 Above is a selection of the boots I'm a little bit in love with from the House of Fraser boots collection. 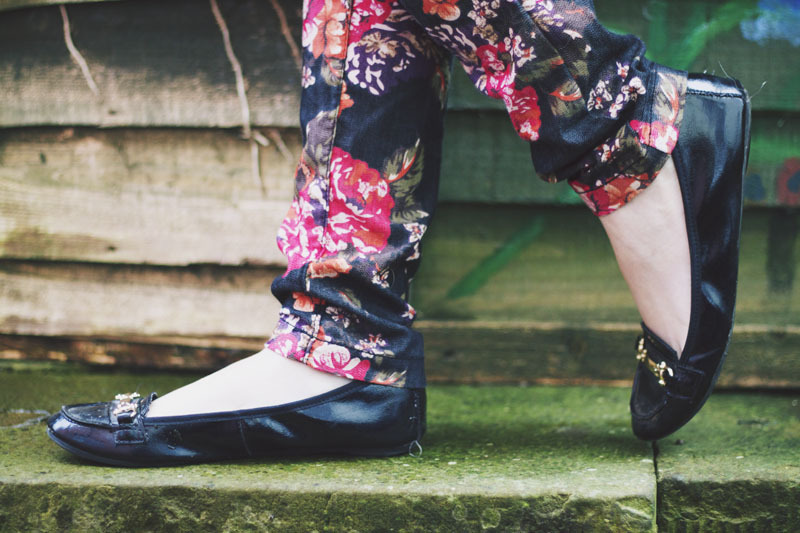 One of my most favourite things about autumn fashion is the footwear and sometimes that can get overlooked, perhaps because its easy to wear the same pair all winter long. I must admit my own very much loved boots are well worn throughout the cooler months with the rest of my shoe wear not getting a single outing. I could happily spend the entire autumn in a pair of boots, there is something very comforting about having a nice cozy pair of socks and a pretty, stylish boot on your foot. With there being so many style of boot around its very easy to be fully booted up all year round. I'm lusting after the Carvela Shore Boots, Dune Pearly Covered Gusset Buckle Shoes and the Bertie Nimmo Suede Leath Mix Boots (3, 6 & 7). What pair is your favourite? I do really love these shorts from Topshop. I brought them as an impulse buy a few years ago and I'm so glad I got them, they have been worn loads since I brought them. The illustration is really pretty and I think the colour scheme works so well in winter. 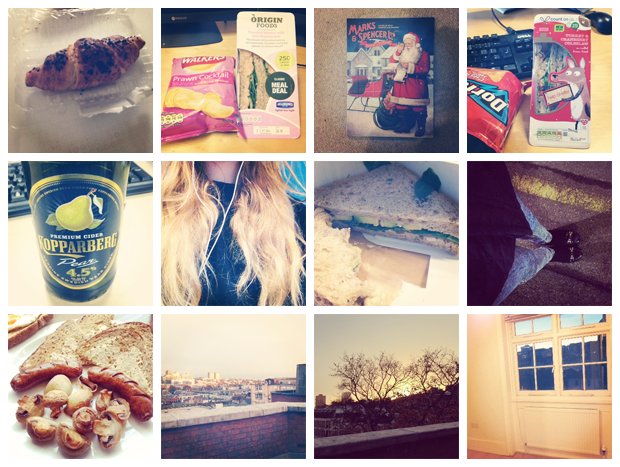 This week I've just been chilling in the evenings, going to the pub, eating out and having very naughty and unhealthy food. 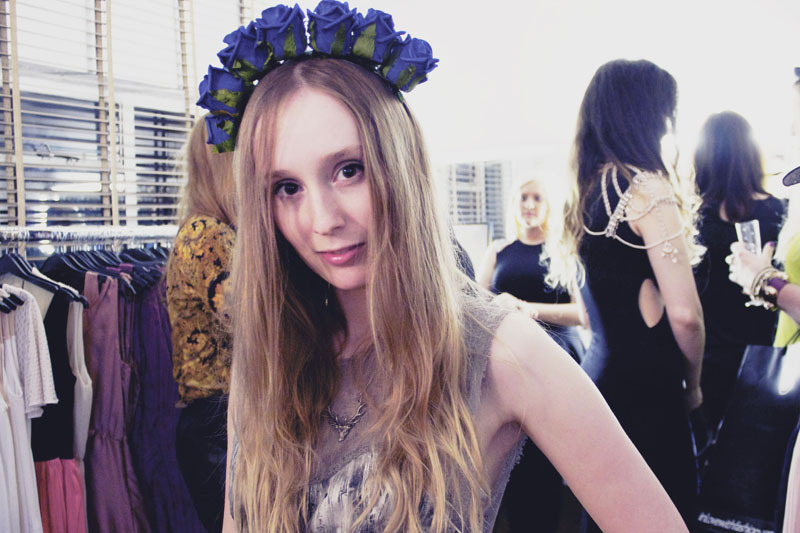 On Thursday night I went to the inlovewithfashion event and went for mulled wine at a pub nearby afterwards. This weekend I've been busy sorting out my room by putting my furniture back together and will be going to see the movie "The Master" tonight by Paul Thomas Anderson. Looking forwards to it! 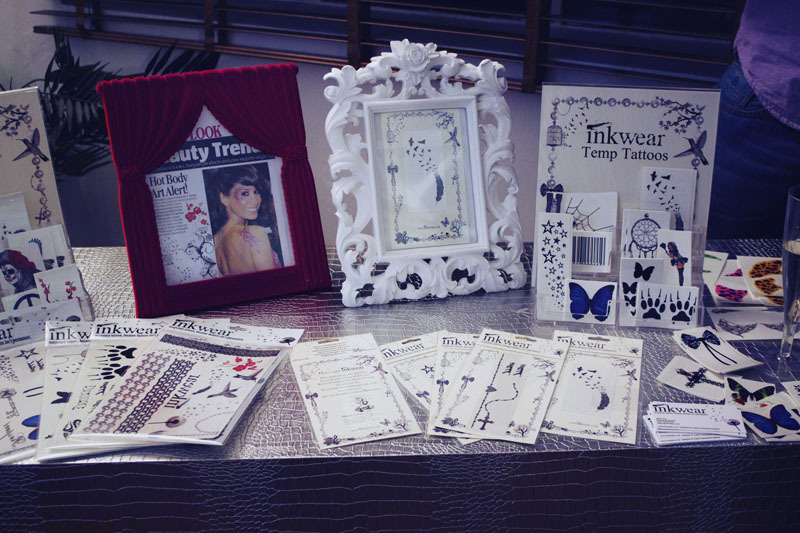 Inlovewithfashion Next Top Designer event. 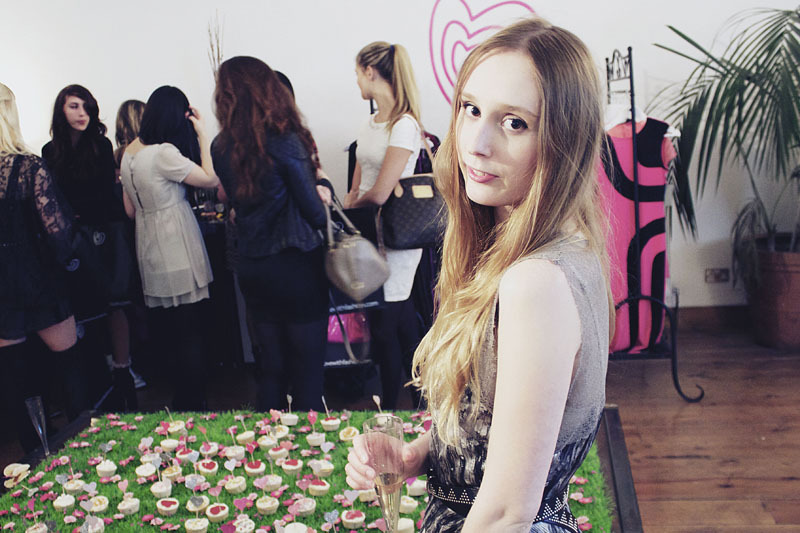 I recently attended the Inlovewithfashion next top designer event up in London. 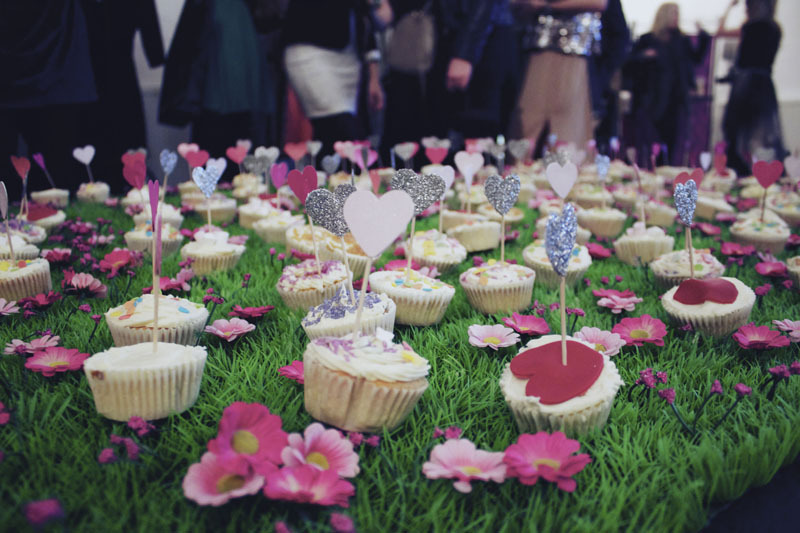 It was a great night with scrummy cupcakes, champagne and a room full of super stylish top bloggers. I got to meet some lovely people and was very flattered to be invited. They had a fashion show concluding their search for their next top designer. 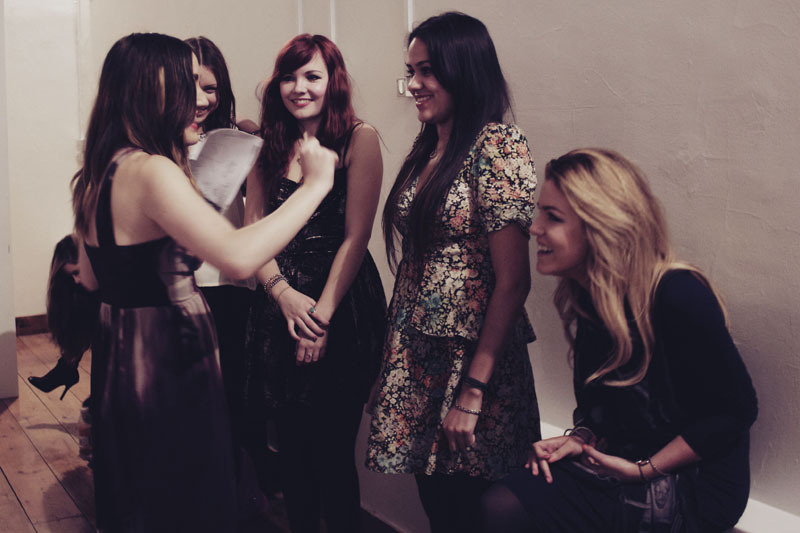 Five girls had designed a dress each and the prize was to have their dress put into production by Inlovewithfashion. There was a judging panel to decide whose dress they thought deserved to win the prize. 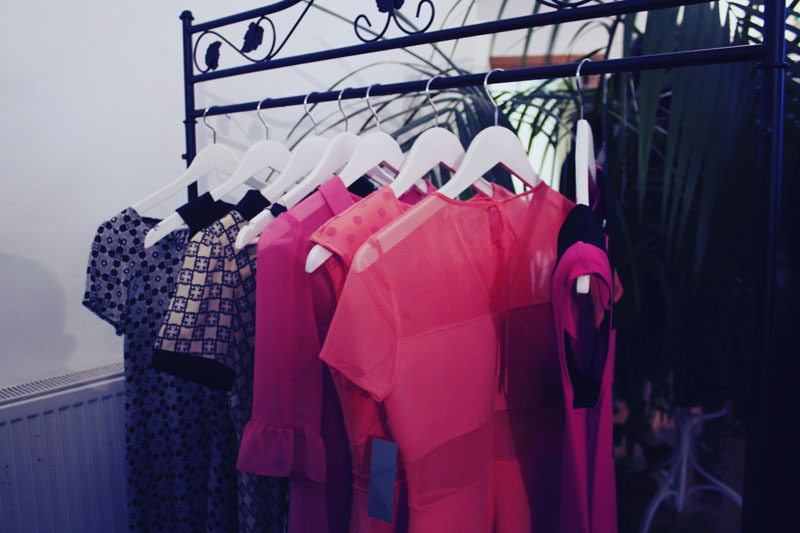 The five dresses were showcased one after one along with a quick questionnaire from the judges to the designers. I had a quick chat with the winner who told me she had only just recently graduated this year from a fashion course and was very chuffed to have won. What do you think of the dresses? Which is your favourite? I am a little bit in love with these jeans. I have had them for two years now and they are still one of my favourite pairs. 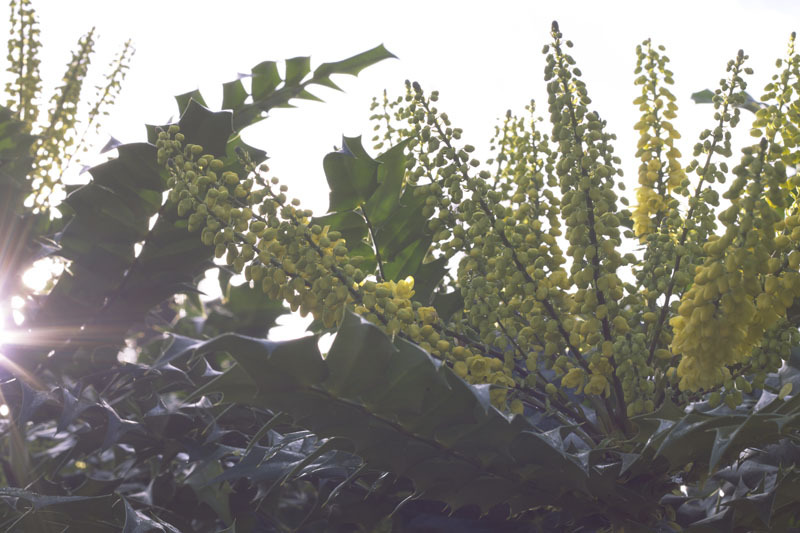 I took these photos down a cute little alley way in the north laines in Brighton. I'm actually moving house tomorrow to a couple of streets down from this alley way so it may become a favourite outfit photo spot. 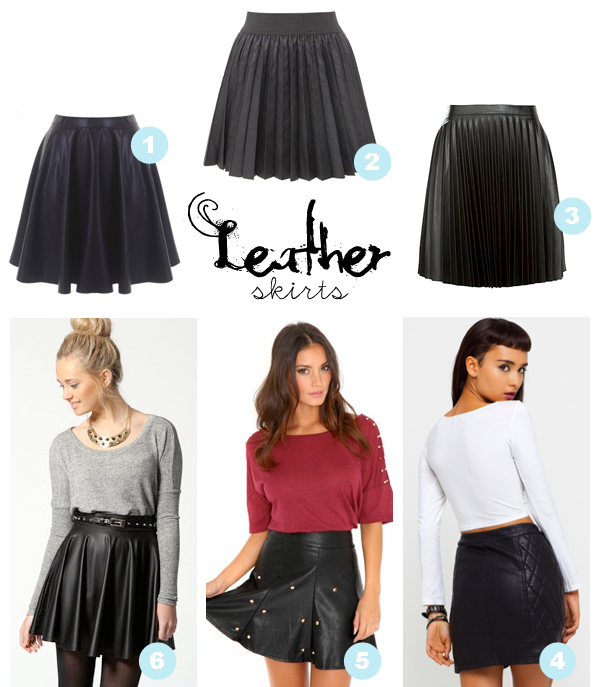 Leather skirts seem to be every where nowadays and in many variations: skater, pleated, black, pencil, zipped, studded, buttoned. It is great to mix up with other textures such as a sheet shirt or a lace blouse. I think this trend works best in deep dark tones and jewel colours as lighter shades can look a bit cheap if you don't get a good quality skirt. My favourite variation of this trend is the skater version. 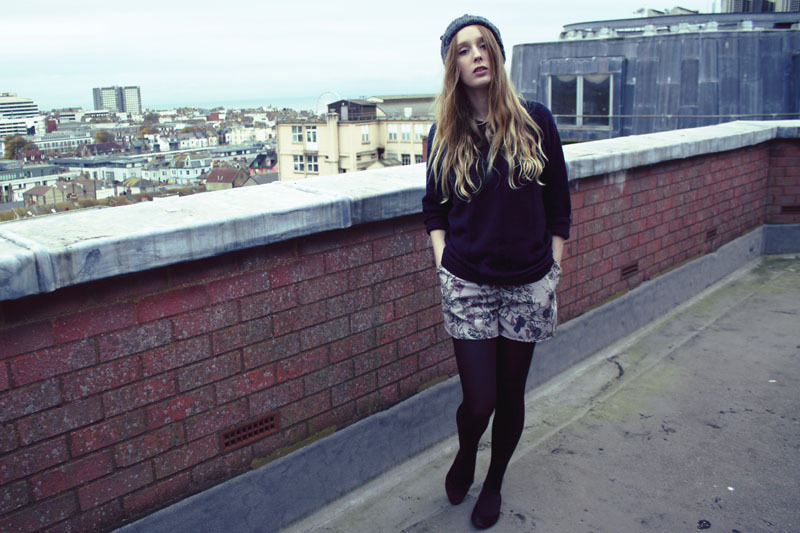 Being in a stiffer fabric compared to cotton or lyrca skater skirts they look like they wouldn't blow up at the first sign of a bit of a breeze, something that really puts me off skater skirts when I have to walk along the ever so windy Brighton seafront. 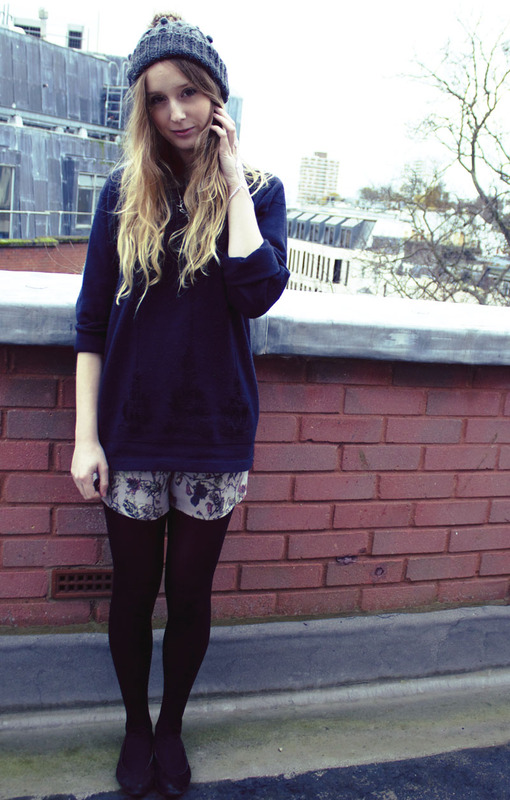 Below are some ever so chic lookbookers attempts at this street smart look. Fireworks night is always such a tricky one when it comes to style and dressing warm. It always involves a lot of standing around in the cold whether you go to a local big event or just fireworks in the garden. 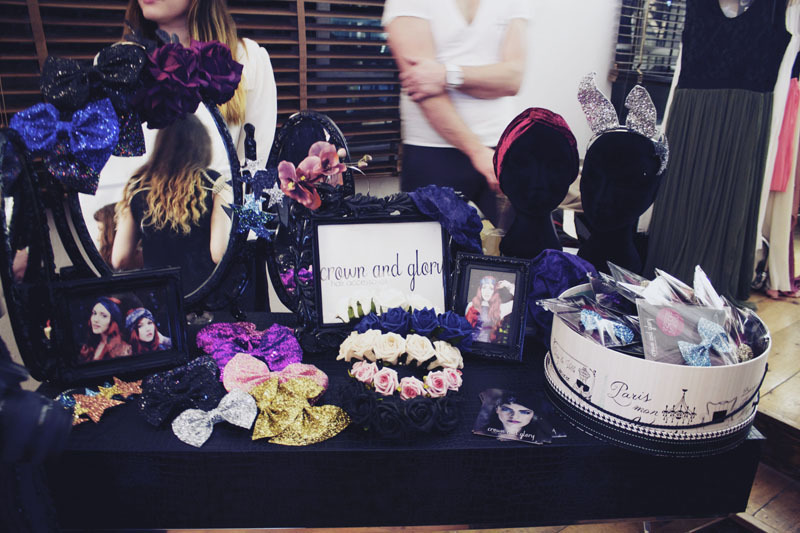 This is just a collection of items I would wear. 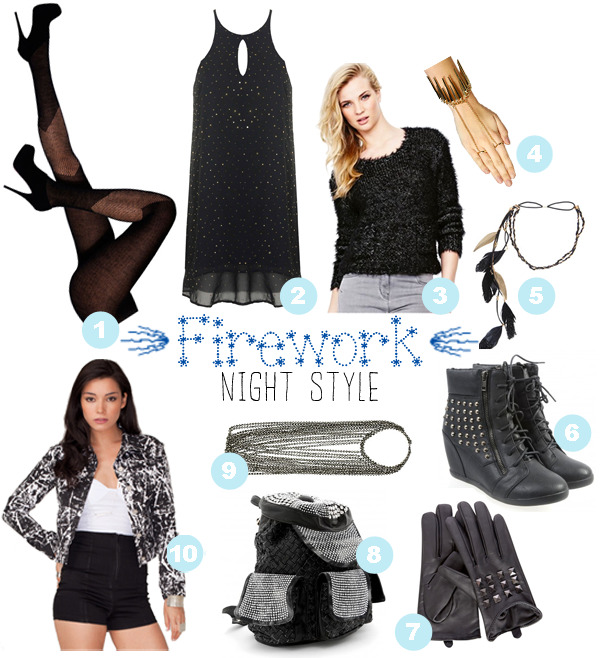 Woolly tights are a must have for nights like fireworks night, thing is they can look a bit frumpy and boring sometimes. The woolly tights above are by FAST at Jonathan Aston Woollies Tights (you can view his collection here). I hope you will agree they are a much more stylish take on traditional black wooly tights. 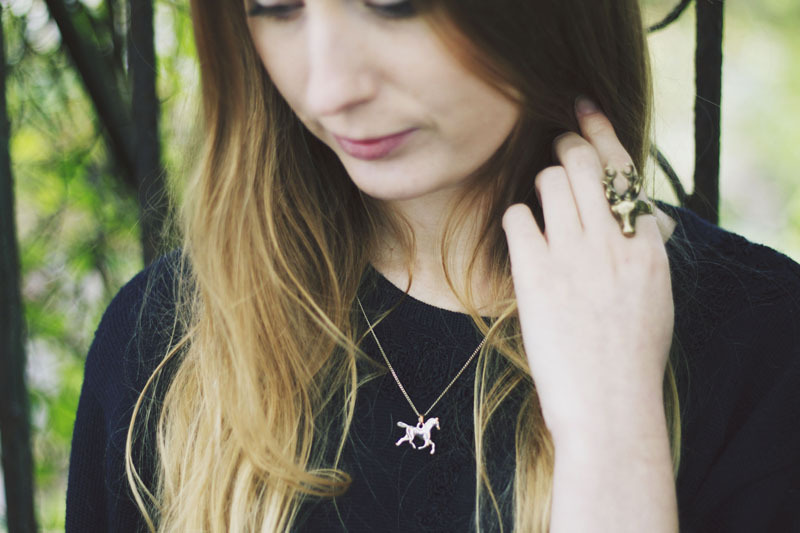 I have noticed Boohoo have some amazing accessories and jewellery in stock online at the moment. 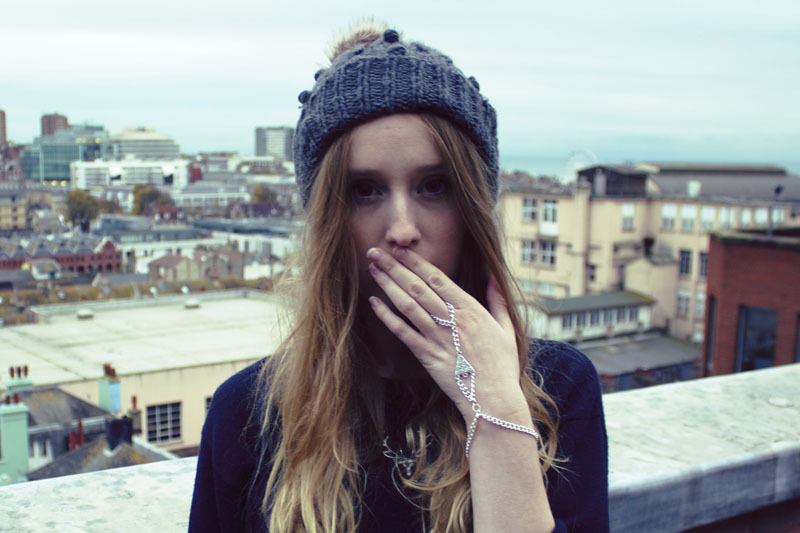 This spike hand harness would be perfect for autumn events, I really love detailed hand jewellery like that. My other must have item in this post is the Missguided rucksack. I'm a bit of a sucker for backpacks and the fact I always overload my handbag with heavy items does mean I get to give my back a bit of a break when I chuck on a rucksack instead. What are your must have fireworks night accessories? So I've kind of cheated on this one... I haven't taken many photos this week due to organising myself for the house move as I'm moving next weekend. 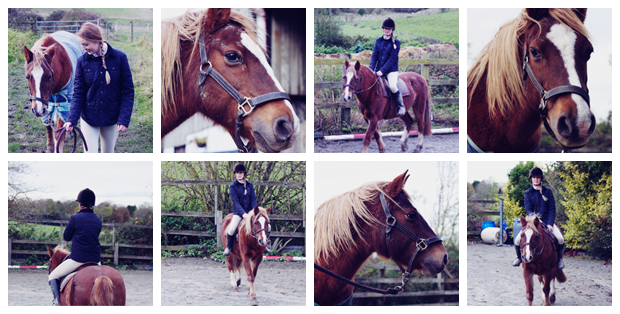 These photos were taken yesterday whilst I went up to the yard to visit Merry and have a little ride. I haven't been able to ride her lately due to all this house moving business which is taking up the majority of my free time at the moment. Anyway I you still enjoy these photos, isn't she the most gorgeous chestnut pony? Her winter coat turns her into a fuzzy teddy bear. Hope you have all had a lovely week! What have you been up to?